Are you planning an upcoming trip to or from New Hampshire? With access to thousands of vehicles across the nation, Shofur should be your first choice for group transportation solutions throughout the Northeast. Rental representatives are available around the clock to assist you in finding the best charter bus for your next New Hampshire trip. Call us at 1-800-436-8719 for a free, personalized quote! Shofur is here to make group travel around New Hampshire as simple as possible. Our services span different types of events including wedding services, corporate conventions, school field trips, and sporting events. 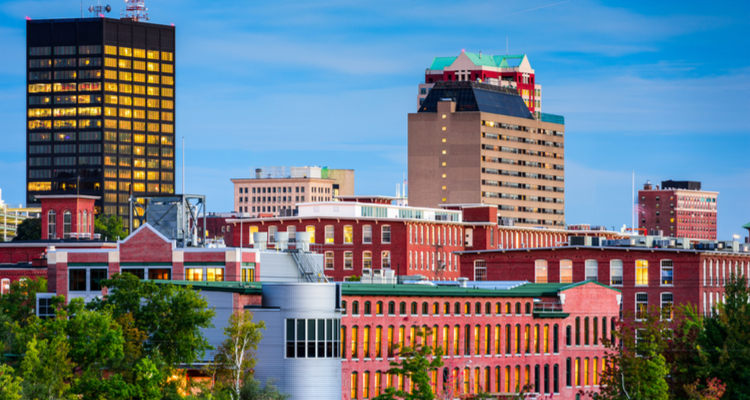 We work with a large network of bus providers and transportation professionals to transport groups around New Hampshire, the Northeast, and beyond. Groups of all sizes and types will find a suitable charter bus for their travel needs through Shofur. From full-sized motorcoaches to minibuses, your group will have a range of buses to choose from. These charter buses include models with additional amenities like reclining seats, WiFi, power outlets, and televisions with DVD players for comfortable travel. Ditch the traditional yellow school bus for your next field trip! A private charter bus offers the optimal comfort that normal school buses don’t provide. That way students and chaperones won’t have to travel around in a cramped and muggy school bus. The buses in our network include sleek and modern models to keep everyone content no matter the length of the trip. Whether your group is taking a field trip to the Squam Lakes Natural Science Center in Holderness or the USS Albacore Museum in Portsmouth, we ensure your school group will get around safely. New Hampshire is home to numerous top-quality centers of higher education. School groups planning college tours can shuttle to different campuses across the state with a private motorcoach. Easily travel to schools like the University of New Hampshire in Durham, Dartmouth College in Hanover, and Southern New Hampshire University in Manchester. If you’re organizing a group trip to explore the New Hampshire outdoors, Shofur will find your group the perfect charter bus for your activities or event. You can utilize a charter bus if your company is planning an outdoor team-bonding day or if you’re taking a group of friends and family for a day filled with hiking. A charter bus will keep your entire group together rather than needing to organize carpools and worrying about group members getting lost on the way. Everyone in your group will get to locations like Flume Gorge and Mount Washington while traveling in a spacious and climate-controlled motorcoach. Your professional driver will traverse the roads so your group can relax after a long day of hiking and outdoor activities. Wedding planning can be stressful. Don’t add transportation to your list of worries! Shofur will handle the transportation logistics for weddings of all sizes. Wedding shuttle buses streamline transportation to keep traffic minimal around venues and to ensure everyone arrives for the ceremony on time. Choose from sleek models of minibus for smaller ceremonies or modern full-sized coaches for large services. From an elegant wedding at the Birch Wood Vineyards to a beautiful service at The Margate Resort, let Shofur handle the shuttle transportation. Are your ready to book your charter bus transportation around New Hampshire? We have rental experts on standby around the clock to help you throughout the rental process. We’ll find you the best charter bus option and get you a free, personalized quote for your travels. Travel to and from Manchester, Concord, Rochester, and even out-of-state to cities like Boston and New York City with ease.